Home Search and Rescue Coast Guard Cutter Nantucket returns survivors to Coast Guard Sector St. Petersburg, Fla.
Coast Guard Cutter Nantucket returns survivors to Coast Guard Sector St. Petersburg, Fla.
ST. PETERSBURG, Fla. — Three boaters who were rescued by the Coast Guard Monday evening, after their 30-foot sailing vessel suffered engine failure 80 miles west of Tampa, arrived at Coast Guard Sector St. Petersburg, Tuesday. The Coast Guard Cutter Nantucket, a 110-foot Island Class patrol boat homeported in St. Petersburg, returned to the sector at 5 p.m. with all three survivors. The initial distress started when their vessel lost power early Monday. An aircrew aboard an MH-60 Jayawk helicopter from Coast Guard Air Station Clearwater was launched to the location of distressed mariners. Once on scene, the Jayhawk’s crew spotted the sailing vessel Grateful with three people aboard. 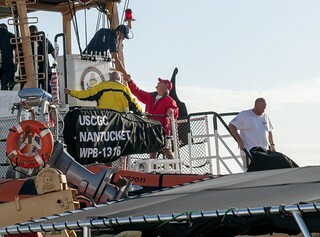 The Nantucket crew was launched at approximately 11 a.m., arrived on scene at 5:30 p.m., and took the vessel in tow. There are no injuries or medical concerns to report.